Peripheral blood stem cell (PBSC) harvest is a procedure in which stem cells are harvested from a donor sibling or a relative and transfused to the recipient to restore their blood cells after chemo and radiation therapy. With ever increasing need for donors, young children are increasingly serving as donors for their sibling. To facilitate this donation, general anesthesia or sedation is required, especially in the pediatric age group. With the constraints for operating room time and increasing number of surgeries planned under anesthesia, there is a shortage of available space and time to do PBSC harvest in the operating theater setting. Therefore, nonoperating room anesthesia (NORA) is an alternative way of PBSC harvest under anesthesia at the daycare collection. NORA outside a controlled setting, particularly in pediatric population, is demanding and poses a unique challenge in itself. Although the feasibility of PBSC collection and catheter insertion in children has been studied in the literature, its safety needs to be established further. This experience of PBSC harvest of 154 children under anesthesia in the outpatient daycare setting at our center is described below. All healthy pediatric stem cell donors who underwent PBSC harvest under anesthesia in the daycare setting in the Department of Hematology, Christian Medical College, Vellore, India, between January 2009 and June 2017 were included for the analysis. Details were obtained from apheresis records. All the donors planned for leukapheresis were examined in the presence of a parent, and an informed consent was obtained after explaining the anesthesia procedure in the preanesthesia clinic (up to 7 days before the day of the procedure). The parents were informed and advised to keep the child from contracting any respiratory illness or infection. This was necessary as the date for transfusion for the recipient would be planned and preparation started for the same. They were reviewed again on the previous evening of the procedure by the anesthesiologist. A unit of blood is cross-matched and kept ready for priming the apheresis circuit before the procedure. Children <8 years of age were premedicated with triclofos sodium syrup 75 mg/kg, and children older than 8 years were given tablet lorazepam 1 mg, 60 min before the time of induction. Children were induced with either an intravenous agent, if willing for peripheral venous access, or an inhalational agent (sevoflurane), in the presence of a parent. In the inhalational group, a peripheral venous access was established after the induction, and the parent was then escorted to the waiting area. Once an intravenous line was secured, a maintenance dose of intravenous anesthesia was started and inhalational agent was dialed off. 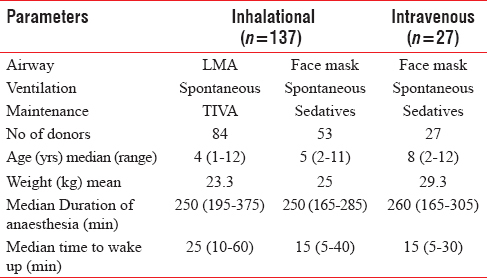 The anesthesia was maintained through an intravenous infusion with various drugs as mentioned in [Table 1] using either face mask or a laryngeal mask airway (LMA) to provide oxygen. A central venous catheter was inserted in the right femoral vein for collection of blood into the leukapheresis machine. Another peripheral venous access was established for return of blood from the machine back into the patient. During the procedure, monitoring of heart rate, blood pressure, respiratory rate, oxygen saturation, and end-tidal carbon dioxide were done using a noninvasive monitor. Intraoperative hypotension was managed with crystalloid (Ringer lactate or 0.9% saline) or vasopressors such as phenylephrine or ephedrine boluses. Blood was transfused if hemoglobin was <10 g/dl. In case of any adverse reaction following transfusion of any blood product(s), management was done according to standard treatment protocols. Blood calcium and blood sugar levels were not routinely monitored. Once the blood collection was complete, maintenance anesthetic infusions were stopped and LMA removed (where LMA was used) when the children were fully awake. Normal hemodynamics, respiration, neurological status, and temperature were ensured before transferring the children from blood collection area to the ward. The preinduction reassessment, induction of anesthesia, maintenance doses of anesthetics, central line insertion, and awakening of the donor are performed by a consultant anesthesiologist. The children were monitored in the ward by the nursing team till complete recovery from the effects of anesthetics. The secondary analysis of data of a cohort of 164 pediatric PBSC harvest (154 pediatric donors, of which 10 had repeat harvesting done) were performed using SPSS 16.0 statistical software (SPSS for windows, version 16.0. Chicago, SPSS Inc). Descriptive statistics and frequencies were used for the data description. The most common indication of bone marrow transplant was thalassemia major (n = 110), followed by bone marrow failure syndromes (n = 23). Out of the 10 donors who underwent repeat harvest, 5 were for inadequate stem cell retrieval during the first harvest, and the remaining 5 were for graft rejection in the recipient. Six patients (four patients with upper respiratory tract infection and two patients with lower respiratory tract infection) were reviewed again on the day of the procedure and accepted for general anesthesia. The study group ranged from 1 to 12 years with a median age of 5 years. A female preponderance was noticed with 61% (n = 94) female patients. The median weight was about 17.5 (9.4–51) kg and height was 108.5 (77–153) cm. The median preharvest hemoglobin was 10.8 (8.1–14.8) gm% while the median platelet count of the donors on the day of harvest was 277 × 109/L (63–770). All the four donors, whose platelet counts were <100 × 109/L, were transfused with random or single donor platelet concentrates so as to maintain a platelet count of 100 × 109/L before the stem cell harvest. The demographic characteristics are shown in [Table 2]. 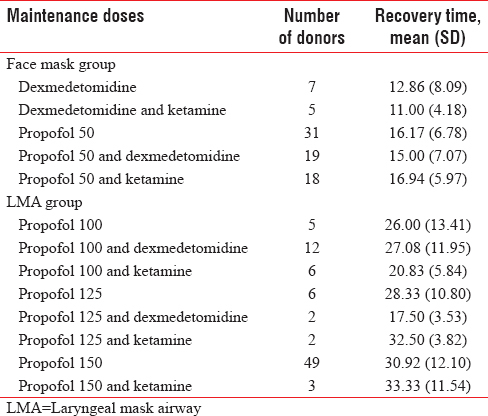 The anesthetic technique involved inducing with sevoflurane in 137 donors with a median age of 4–5 years following which LMA was used as airway device in 84 children (61.3%) and face mask (Hudson's) in 53 children (38.7%) as shown in [Table 3]. The 27 children (16.46%) with a median age of 8 years who cooperated for an intravenous line, underwent intravenous induction of anesthesia followed by maintenance with intravenous infusion of anesthetic drugs. All the children breathed spontaneously and the anesthetic drugs were titrated to maintain anesthesia, facilitating the harvest procedure. The drugs and its dosage for total intravenous anesthesia (TIVA) were decided by the consultant anesthesiologist. [Table 4] details the distribution of different combinations of intravenous agents used. The right femoral vein (n = 143) was cannulated mostly as the apheresis machine is placed on the right side of the patient. The catheters used were 16G, 17G, 20G (Vygon® or Leader Cath®) single lumen or 5 Fr (Arrow®) triple lumen. There was one inadvertent right femoral arterial puncture, where the artery was cannulated and used for harvesting blood into the leukapheresis machine. The left femoral vein was cannulated in 18 patients while the right cubital vein and the right internal jugular vein were cannulated for two patients on whom the right femoral vein cannulation failed. Ultrasound was used for 7 patients to identify the plane of insertion for venous catheterization. [Table 5] details the attempts at venous cannulation and the age groups. The average analgesic requirement for fentanyl was 1.06 mcg/kg, and volume of intravenous fluids used was 3.57 ml/kg body weight per hour. Since the apheresis line was primed with 300 ml of irradiated blood, none of the donors further required any additional blood transfusion during the procedure. Seven donors developed transient hypotension during the apheresis, requiring fluid boluses and vasopressor support (ephedrine 3 mg aliquotes). All the seven patients had received TIVA with propofol infusion at 150 mcg/kg/min. Median duration of anesthesia was 250 (165–375) min. The recovery from anesthesia was smooth, and all donors were fully awake at a median time of 20 (5–60) min from the time of cessation of the harvest. In donors in whom LMA was inserted, the median time to wake up was found to be 10 min longer than the other group. [Table 6] shows the number of donors and the time taken from stoppage of the infusion to be completely awake. Postoperative nausea and vomiting were seen in one donor following the procedure. Seven children had hypotension during the procedure, and all the 7 donors received propofol 150 mg/kg/min. Three donors developed bronchospasm after the procedure which was treated with drugs and did not require intubation. One child who received propofol infusion at 100 mcg/kg/min developed laryngospasm followed by bradycardia. Another donor, toward the end of the procedure, developed acute pulmonary edema and hypotension due to blood transfusion. The child was transferred to pediatric intensive care unit for further management and subsequently made a complete recovery. The administration of anesthesia/sedation to patients undergoing painful or uncomfortable procedures outside the operating room is termed as NORA. Children form the largest group needing NORA because of their inability to cooperate with painful and lengthy procedures. PBSC is one such procedure that involves insertion of a central venous catheter followed by continuous leukapheresis for 3–4 h, thus requiring anesthesia in children. Providing anesthesia to pediatric population requires optimal training, skill, and support to ensure safety. TIVA in pediatric population is not routinely used by anesthesiologists. Propofol, a nonbarbiturate sedative and hypnotic with quick onset and recovery, is the drug most widely used for TIVA, especially in remote locations. In our study, propofol was commonly used for induction as well as for maintenance of anesthesia, due to better pharmacokinetics and stable hemodynamics. Apart from the above-mentioned properties, it also has antiemetic, anticonvulsant, antipruritic, and amnestic actions. The significant advantage of intravenous induction is stable anesthesia in a controlled setting avoiding room pollution if inhalational agents are used. However, when propofol is used as a sole TIVA agent, higher doses are required which may produce dose dependent hypotension and respiratory depression. All the venous cannulations were done under complete aseptic precautions using anatomical landmark technique. The right femoral vein has been the vein of choice for catheter cannulation over left femoral vein, due to the proximity of apheresis machine. Although multiple studies have proven that there is a considerable overlap of the femoral vein by femoral artery and variations in the position of saphenofemoral junction, there is less evidence supporting the routine use of ultrasound in aiding access to femoral central vein in children. It has also been shown that there is no greater advantage in using ultrasound for femoral vein cannulation by an experienced anesthesiologist. In our institution, anesthesia for PBSC harvest is performed by consultants and ultrasound was used in only 7 patients. In 3 patients, USG was used after an unsuccessful first attempt by landmark technique to identify the plane of insertion for catheterization. Only 10 patients (<6 years of age) in the study underwent multiple attempts for cannulation. The most common complication of femoral venous cannulation is adjacent femoral artery injury, and in literature, this incidence ranges between 4.2% and 9.3%.,, In our analysis, although inadvertent femoral arterial puncture occurred in one case, a catheter was placed in the femoral artery and apheresis procedure was commenced. The incidence of arterial puncture was 0.6% which is far less than the incidence quoted in literature. Hematoma during central venous catheter placement is not often a life-threatening complication as it can be easily controlled with pressure at the site of insertion, and is reported to be around 4.7%. Only one patient in our study cohort developed venous hematoma post procedure, which was monitored in the ward and the patient made an uneventful and complete recovery. The central venous catheters were removed only the following day, after confirming the adequacy of cell count. There was no catheter-related bloodstream infection at any point of time. Owing to the large extracorporeal separator volume compared to the child's weight, PBSC can result in various problems, such as unstable hemodynamic or metabolic parameters. Initiation of extracorporeal separator volume can cause fluid shifts. This is prevented by priming the apheresis circuit with blood and then withdrawing blood at a slow rate, which is the reason for the longer duration of the procedure, averaging 3–4 h.
The vital parameters were monitored with a noninvasive monitoring device, and overall, the anesthesia was well tolerated without any major adverse events. Hypotension, that occurred in 7 donors who received propofol infusion at 150 mg/kg/min, was treated with ephedrine and fluid boluses. The reason for hypotension could be due to the higher dose of propofol causing significant inhibition of peripheral sympathetic vasoconstrictor outflow. Studies have shown that combination of agents like propofol – ketamine are more effective than using propofol alone as a sole agent as the combination counteracts the side effects while maintaining sedation. One donor, out of the 3 who developed bronchospasm had received propofol infusion at 125 mcg/kg/min whereas the other 2 donors received propofol 100 mcg/kg/min. 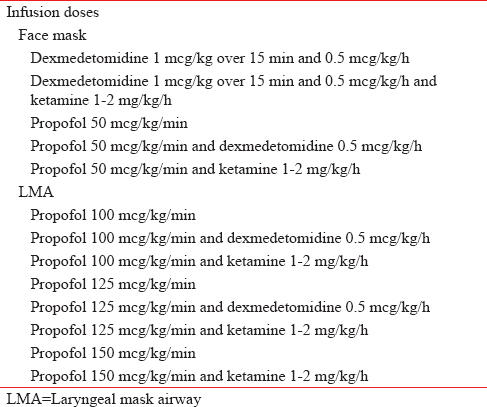 Moreover, a child who had received propofol 100 mcg/kg/min developed laryngospasm followed by bradycardia probably due to inadequate depth of anesthesia. This clearly explains that combination drugs are way superior in providing smooth anesthesia than sole agents. All the children were managed appropriately and after adequate monitoring were sent to ward. The combination of dexmedetomidine + ketamine showed a faster recovery with a mean of 11 min when compared to other maintenance infusion doses while propofol 150 mcg/kg/min + ketamine exhibited a slower recovery with a mean of 33.33 min. Overall in our series, as compared to other studies, very few side effects were noted. One serious apheresis-related side effect (pulmonary edema requiring intensive care unit admission) and mild anesthesia-related transient side effects (transient hypotension, laryngospasm, and bronchospasm) were noted in donors from the LMA group. Face mask group showed a faster recovery and no complications when compared to LMA group. All donors were discharged on the next day of harvest, and no long-term complications have been reported in any of these donors during the subsequent follow-up in the Hematology Department. We have found that all the children were adequately anesthetized/sedated during the harvest based on their clinical response although satisfaction scores from the parents and children were not collected in the postprocedure period. The use of BIS monitor could have theoretically improved the overall care of the donors; however, it was not used in our study. Routine check of blood calcium and glucose levels was also not done. This retrospective analysis demonstrates that NORA for pediatric age group for PBSC harvest can be safely and successfully accomplished outside the operation room setting by a consultant anesthesiologist, with adequate monitoring, proper choice of technique, and combination of medications to ensure safety during and after the procedure. Metzner J, Domino KB. Risks of anesthesia or sedation outside the operating room: The role of the anesthesia care provider. Curr Opin Anaesthesiol 2010;23:523-31. Hill M, Peat W, Courtman S. A national survey of propofol infusion use by paediatric anaesthetists in Great Britain and Ireland. Paediatr Anaesth 2008;18:488-93. Zielinska M, Holtby H, Wolf A. Pro-con debate: Intravenous vs. inhalation induction of anesthesia in children. Paediatr Anaesth 2011;21:159-68. Eyres R. Update on TIVA. Paediatr Anaesth 2004;14:374-9. Fechner J, Ihmsen H, Hatterscheid D, Jeleazcov C, Schiessl C, Vornov JJ, et al. Comparative pharmacokinetics and pharmacodynamics of the new propofol prodrug GPI 15715 and propofol emulsion. Anesthesiology 2004;101:626-39. Shukry M, Miller JA. Update on dexmedetomidine: Use in nonintubated patients requiring sedation for surgical procedures. Ther Clin Risk Manag 2010;6:111-21. Available from: https://www.pdfs.semanticscholar.org/5188/bba67f1c0ef5592514a26420c527b7ae637e.pdf. [Last accessed on 2018 Jan 26]. Assessment of Different Concentration of Ketofol in Procedural Operation | British Journal of Medical Practitioners. Available from: http://www.bjmp.org/content/assessment-different-concentration-ketofol-procedural-operation. [Last accessed on 2017 Oct 22]. Tosun Z, Akin A, Guler G, Esmaoglu A, Boyaci A. Dexmedetomidine-ketamine and propofol-ketamine combinations for anesthesia in spontaneously breathing pediatric patients undergoing cardiac catheterization. J Cardiothorac Vasc Anesth 2006;20:515-9. Tobias JD. Dexmedetomidine and ketamine: An effective alternative for procedural sedation? Pediatr Crit Care Med 2012;13:423-7. Chun EH, Han MJ, Baik HJ, Park HS, Chung RK, Han JI, et al. Dexmedetomidine-ketamine versus dexmedetomidine-midazolam-fentanyl for monitored anesthesia care during chemoport insertion: A prospective randomized study. BMC Anesthesiol 2016;16:49. Murphy PC, Arnold P. Ultrasound-assisted vascular access in children. Contin Educ Anaesth Crit Care Pain 2011;11:44-9. Gurien LA, Blakely ML, Russell RT, Streck CJ, Vogel AM, Renaud EJ, et al. Real-time ultrasonography for placement of central venous catheters in children: A multi-institutional study. Surgery 2016;160:1605-11. Robinson BJ, Ebert TJ, O'Brien TJ, Colinco MD, Muzi M. Mechanisms whereby propofol mediates peripheral vasolidation in humanssympathoinhibition or direct vascular relaxation? Anesthesiol J Am Soc Anesthesiol 1997;86:64-72. Available from: http://www.bloodjournal.org/content/bloodjournal/86/1/372.full.pdf. [Last accessed on 2017 Aug 20].